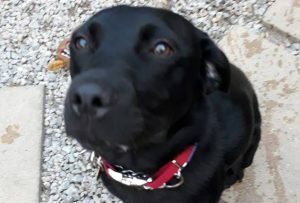 PREZZO Is the most gorgeous 1 year old black lab (possibly cross as small size) girl. She has a wonderful nature and loves everyone, and has been brilliant with children, cats and dogs while in foster. She is a very good girl and is house and crate trained, and settles well, but would live the company of another dog to be with, especially one who can show her the ropes. She’s great with traffic and most obstacles, can be a little over zealous out and about meeting people and new dogs, but has been noting but friendly, just slightly excited due to a lack of exercise and socialising til recently. We will prioritise enquiries from those who already have an existing dog, and who have an interest in continuing to give her opportunities to learn and have fun while doing so. If you are interested in her, please fill out a form atwww.lunaanimalrescue.org and give as much detail as possible.